The new DSM insurance system takes advantage of the services of DSM’s third party scrubbing partner, Yost Engineering Inc. (YEI). 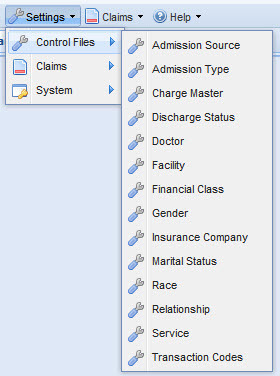 To scrub a claim the insurance clerk clicks “Next Step” which presents options in a dialogue box. The clerk then selects “Scrub Claim” which sends the claim info to YOST through secure Internet communications. The report above is also parsed out to the “scrub” window of the claim, which is on the same screen as the claim. It’s all on one screen for the insurance clerk. To mark an error as having been corrected, the clerk double clicks the error. Errors are fully described (left). 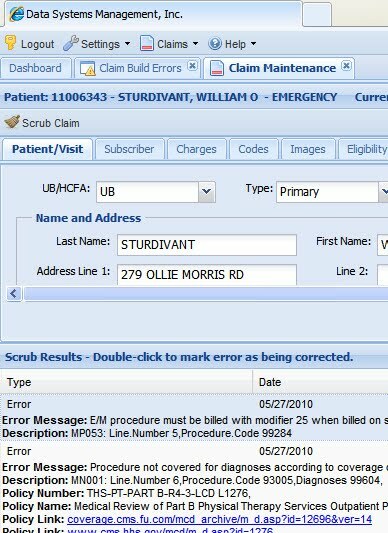 In this case, the error is medical necessity and the Policy Number from the CMS book is displayed along with the policy name. 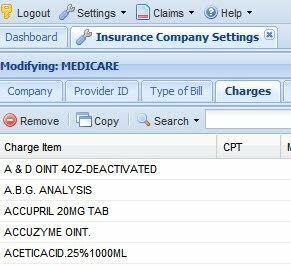 A policy hyperlink is provided which allows the clerk to click the link, opening a browser window with the appropriate bulletin in the “Medicare Coverage Database Archive”. How easy is that? The edits are all up-to-date because the claims are scrubbed online with the latest updates. No downloading of voluminous files to edit against, just keep an Internet connection. Both Yost and Ingenix are contracted through DSM, so no having to deal with a third party, just DSM. Thanks for reading, keep checking, more articles coming! 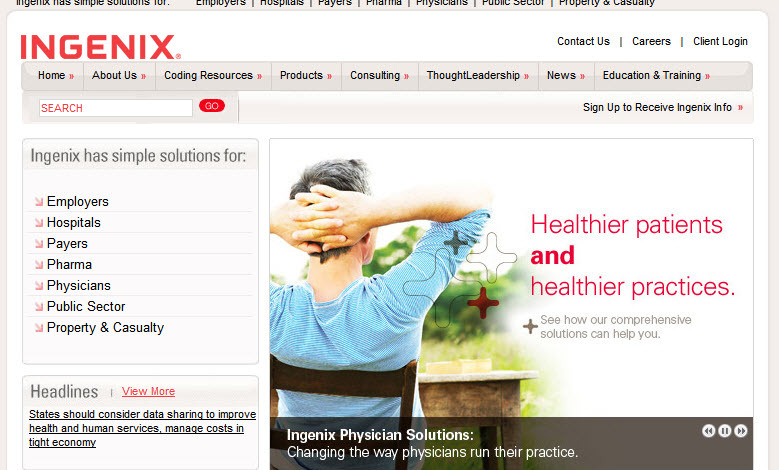 Our summer EMR conference was attended by Bill Rodakowski from Ingenix to kick off the new DSM and Ingenix partnership. The first thing that we discovered about our two companies is that we seem to be lacking golfing expertise. Bill and DSM programmer John Malone were in a foursome with Guy Geller and Emmett Hennessey of Beacham Memorial. I won’t say anything about the golfing skills of our customers, but as far as Bill and John, well….new grass should grow back fine, but the alligators and fish will be coughing up golf balls for months to come. Luckily our lack of golfing expertise doesn’t reflect on the ability of our companies to create a great new insurance system for DSM customers. Bill’s golfing prowess aside, we were glad he came to Mississippi to share information on Ingenix. This powerhouse of a company is one of the foremost leaders in claim processing in the U.S. Something one doesn’t hear mentioned by other clearinghouses is the fact that Ingenix is actually a company many CHs use to process their claims as well as for testing their programs. 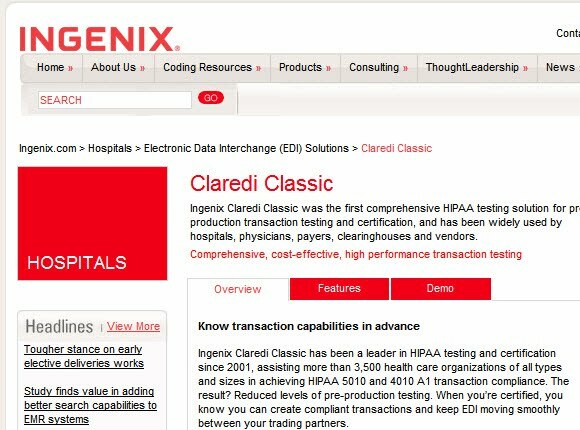 Ingenix is the owner of Claredi Classic, which was the first comprehensive HIPAA testing solution for testing and certification. DSM’s new product includes Claredi testing and certification. The testing infrastructure will be an integral part of the new system, allowing the programmers to get the jump on new regulatory mandates. This has been a great help in getting our programs ready for 5010 and also validating our legacy 4010 programs in use now. The Claredi reports provide easy to read reports for both our technical and non-technical staff, making our staff that much more productive and DSM that much more confident in our new product. New Insurance Programs are on Schedule! DSM announced at it’s recent summer EMR conference a completely new set of programs for processing insurance claims. The new system has been designed to the latest 5010 format required by CMS. The 5010 format requirement will take effect sometime in 2012. With a brand new web interface, our new system positions DSM users for new regulatory changes such as 5010 and ICD10 while at the same time providing new clearinghouse and scrubbing services. In order to meet the ever increasing demands for claim information down to increasingly detailed levels, our programmers have taken the control structures down to the insurance company level (right) and insurance claim build profiles have been enhanced (below). On the left is the field for the patient’s city, state and zip. Of course, for insurance filing purposes, this field is mandatory and that condition is indicated by the red underlining of the field. As the user continues typing and gets to the state code for MS, the correct city, state and zip is displayed for the user to simply click and select. Note that the user doesn’t have to type all of the city name. 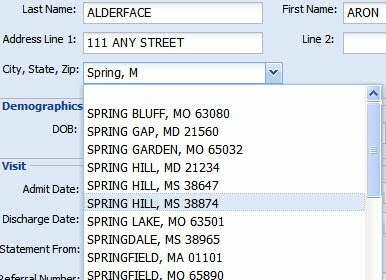 Typing “spring” and then putting a “,” and the first character of the state code, provides a list of cities to choose from in alphabetical order in states that begin with the letter “M”. Predictive text reduces keying and improves accuracy. This first installment article on our new insurance system is just a glimpse. Look for future emails or just check this blog for more in-depth articles on the clearinghouse, claim scrubbing, certification and “deep dives” into the new system which will be available late September to early October.